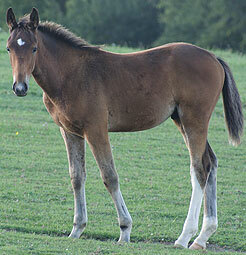 and his dam, which was also herself a great CSI winner and comes from the same damline as Le Tot de Semilly. 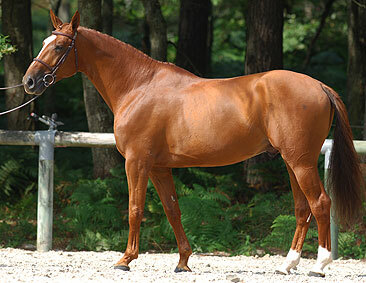 This good looking stallion is extremely easy, supple, reactive, with strength and scope. 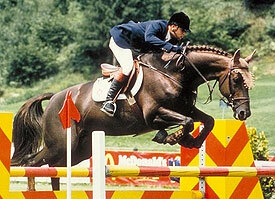 Great international showjumping winner CSIW-CSIO, ISO 177. 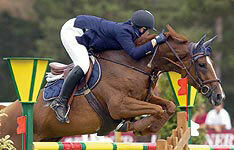 Great international showjumping winner, ISO 160 with a young rider, Adélaïde Malandain. Elodie d'Aursaye had 4 foals : Manhattan, Australia de Safray, Bahamas de Safray and, Melodie de Safray, directly used as a broodmare and who has produced Quointreau Un Prince ISO 162, 5 YO French Vice-Champion and then exported, and placed at the international level. VENUE DU TOT, his 4th dam, exceptional broodmare which was also the mother of Le Tot de Semilly and other stallions and very good showjumping winners. Very regularly placed in Grand Prix Pro and CSI. ISO 150. Since 2015, Manhattant is still competing in CSI2* and finished 6th in the CSI2* of Arnas Champburcy 2016. In 2015, Manhattan is placed 2nd of a 1,45m class in Massongy CSI2*, 7th GP Pro1 Cluny, 7th GP Pro1 Vichy, 6th GP Pro2 Grimaux, etc. 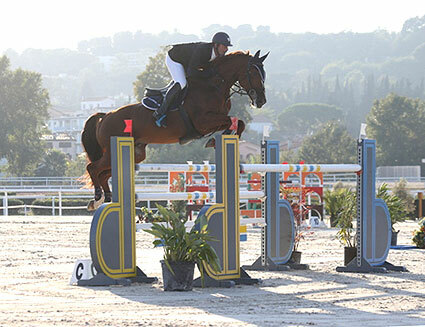 In 2014, Winner of GP CSI2* Cagnes sur Mer, 1st of the 1,45m GP in Massongy, 8th of Ajaccio GP CSI** , 6th of Dommartin GP, etc. In 2013, 2nd GP Pro1 Vichy, 3rd GP CSI2* Aix Meyreuil, 3rd of GP CSI* Cannes, 3rd of a 1,40m class in Grenoble CSI2*, 4th of a GP Pro1 Montluçon, 4th of a 1,40m class in Mantes la Jolie CSI2* , 5th of a 1,40m class in Chazey CSI2*, etc. 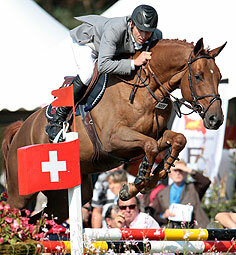 In 2009, he is ranked in CSI : 5th of one class and 11th in the GP at Rodez CSI*, 7th in Vittel CSI, 8th in Riom CSI**. He is also : 6th in a 1,35m speed class and 9th of Vichy 1m40 Grand Prix (cf. video below), 8th of a 1m40 speed class at Ste Cécile, 7th of a 1,35m speed class and 8th in Roanne Vougy Grand Prix, etc. 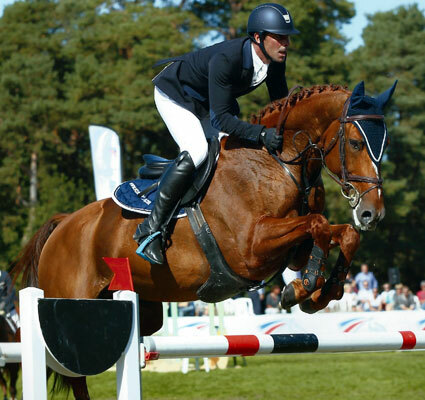 At 7 YO, he is ranked in several small GP : 4th in Roanne Vougy and at the CSI* of Sandillon, 5th in Coutras. He is also ranked in Vichy's small GP and in Vittel's GP. At 6 YO, he has done a great showjumping season, with nearly only clear-rounds and winning some 6 YO speed classes. Winner of the 6 YO Inter-Regional Finals in Normandy. Young Horses jumping classes finalist at 6YO, unfortunately not with his usual rider, Florian Angot, who was at the World Equestrian Games in Aachen at the same time. 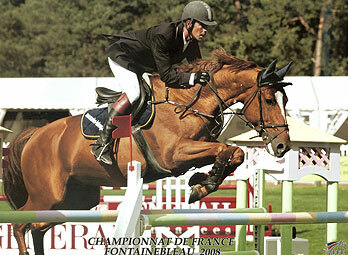 Engaged in the 6 YO classes in Paris CSI*****, Manhattan won the second class and finished 5th in the GP. He began breeding in 2006. This stallion brings his energy, size and wonderful type to his offspring. 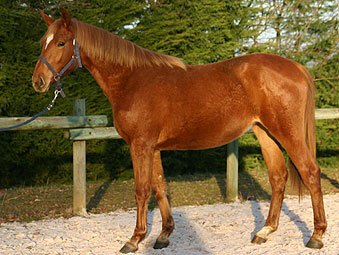 He is easy to cross with the fillies of Jalisco B, Almé or Ibrahim. 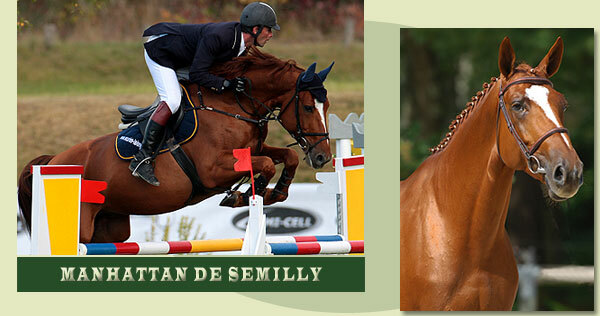 The doses' quality is guarantee and Manhattan de Semilly has got a very good fertility rate.